The 20 men competing in G1 Climax 27 are introduced. A pretty good match and a nice opener. It was pretty quick, but it did an alright job of setting up the Robinson vs EVIL match coming up tomorrow night. EVIL and Takahashi worked very well together as a team while Finlay and Robinson struggled with teamwork. Very good match. Suzuki Gun started with their violent ways, opening the match with a brawl through the crowd. Eventually the match got into the ring, and it ended up with Suzuki pairing off with SANADA and Taichi with BUSHI. Suzuki and SANADA got very competitive which was a fantastic preview for their match tomorrow. Taichi and BUSHI also got pretty heated, making this a highly entertaining match. I’d love to see Suzuki Gun vs Los Ingobernables De Japon at some point. After the match, Taichi rips off BUSHI’s mask. He puts BUSHI’s mask on end ends up walking away with it. This was fun. It started with everyone being very polite and not really fighting, but it gradually turned into a more competitive match when Owens and Tonga started going after Omega’s leg that was injured in his match with Suzuki last night. The action was good, though by the time they got to this being an actual match there wasn’t a ton of time left. It was pretty interesting for tomorrow’s bout between Tonga and Omega though. Omega did not appreciate him and Owens going after his leg, and Tonga had some harsh words for Omega. Pretty good match. There were some nice moments here and there, though nothing stood out as particularly spectacular. It was an alright preview for the next round of Block B matches. Great match. Again, Nagata is coming into this as the sentimental favorite which gave this match a lot of emotion. He stood up to Goto and went nearly blow for blow with him, trading strikes and turning this into a very hard-hitting bout. The crowd helped pump a lot of excitement into this one as well. They were really getting into it and the buzz towards the end of the match grew to a great degree. Goto looked good in this one too, and if he keeps this up he might have a chance at taking A Block. Great match! As hard-hitting as the previous match tonight was, this one went much, much further. These two guys hit each other as hard as they possibly could, and as much as they possibly could. By the end it seemed that every strike could be a finish, but they kept going and kept striking each other even more. This was a lot of fun to watch. Great match! Sabre was able to pull Ibushi out of his game for the majority of the match. He stretched Ibushi and put him in many different holds and submissions, hitting some great counters and transitions. Sabre seemed to have some lapses in judgment though, or maybe got too overconfident at times, because there were times when he left himself open and even invited Ibushi to get into a battle of kicks. Overall this match was a great showing of Sabre’s technical skill and Ibushi’s ability to endure and fight back. A pretty good match. I liked how Tanahashi’s continuing story of his injured arm played strongly in this match, but I think a lot of the action was just alright. Also, the finish to this one made sense, but it wasn’t as exciting as it could have been, and it wasn’t nearly as exciting as the other tournament matches so far tonight. Great match. I feel like it took a little while to get going, but once it did it was extremely competitive. YOSHI-HASHI really pushed Naito and looked quite impressive against one of the favorites in the G1 Climax. The second half of this match was very compelling. While it might not have had the same level of blockbuster math-ups like the first night of A Block, this was an extremely solid show throughout. I also feel like the tag matches didn’t quite build up the next round of B Block matches as well as the first night did, but again, tonight’s matches were all entertaining. I think this and the Ishii/Makabe match were equally good for different reasons. I’m probably more likely to watch this one again though. 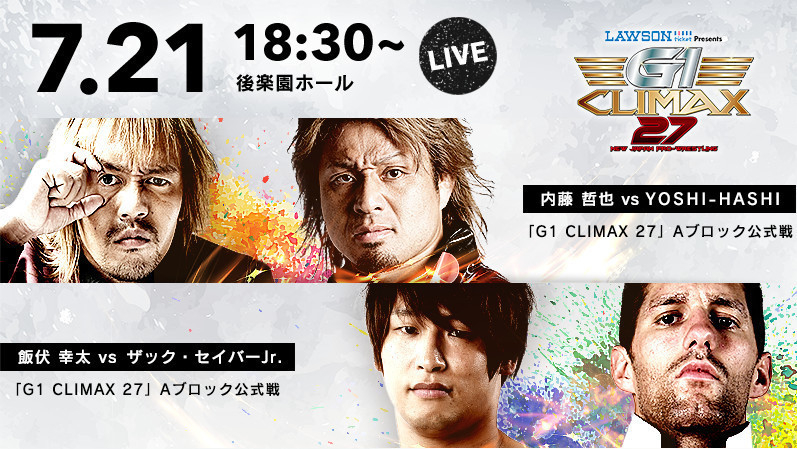 TAGS: Bad Luck Fale Bullet Club Bunkyo Tokyo Japan Bushi Chaos Chase Owens David Finlay Don Callis El Desperado EVIL G1 Climax G1 Climax 27 A Block Match G1 Glimax 27 Gedo Haruo Murata Hiromu Takahashi Hirooki Goto Hiroshi Tanahashi Hiroyoshi Tenzan Japan Juice Robinson Kazuchika Okada Kenny Omega Kenta Sato Kevin Kelly Kimihiko Ozaki Korakuen Hall Kota Ibushi Los Ingobernables de Japon Makoto Abe Marty Asami Michael Elgin Minoru Suzuki NJPW Rabya Minami Red Shoes Unno Sanada Satoshi Kojima Suzuki Gun Taichi Tama Tonga Tetsuya Naito Tiger Hattori Togi Makabe Tokyo Japan Tomohiro Ishii Toru Yano YOSHI-HASHI Yuji Nagata Yujiro Takahashi Yusuke Okamoto Zack Sabre Jr.